Whenever I get newly into something, I’m a sucker for buying all the gadgets, all the add-on bits. When I was eighteen – eighteen for Christ’s sake – I got into cycling and had a racing bike hand made. It cost over £600. This was in 1984, when £600 could buy you a house. The bike had all the latest everything on it, I went completely mad. I’d like to point out I funded its purchase myself. Entirely. From the proceeds of selling ice-cream outside my parents’ shop all summer, every summer, from 1979. Aside from the loan I extorted off my aunt in Italy. But I paid it back. But the bike wasn’t enough. I had to have special cycle shorts (because of course I couldn’t ride it without them). And a special cycle jersey. And hand-made in Cumbria (I didn’t even know where Cumbria was at that point) cycle shoes. And I had a computer thingy on the handlebars that told me how far I’d cycled (not very far at all) and for how long. Thankfully, I lost my virginity a few years later and stopped being quite so mad. My friends from school, of whom I still have four (they are my top, top friends, the inner circle): Alex, Claudia, Emma and Sandra, still occasionally hint at my prior madness. They know that it’s rare I get into something and don’t decide it’s really essential that I have that extra bit of kit. So when I started making bread, I was determined, really determined, that I wouldn’t clutter up the kitchen with any more extra ‘stuff’. I proved my first loaf in a bowl, lined with a tea towel. It worked fine. Well, I say that but the teatowel stuck a bit (was it pure linen? 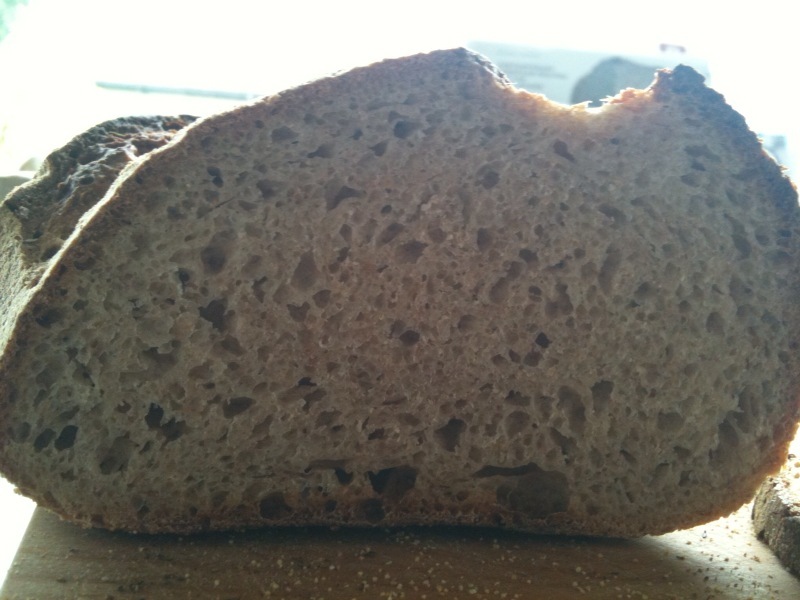 who knew) and well, it was a bit of a faff, turning the loaf out. I’d read about bannetons (aka pa(n)netons in some books), proving baskets, which are made of wood fibre, or cane or wicker. Because sourdough dough is fragile, it needs support when proving, otherwise it’d just spread out like a thick puddle. I decided I liked the wicker ones best, they seemed to make the most sense to me. I was adamant I didn’t need them. I could manage fine with a teatowel and a bowl or sieve, which is what loads of people did I was sure. But then I bought one. And I can reliably report that they really are a purchase worth making. You put the dough in the panneton for the final proof. Then, I cover it with a teatowel (see, I still am using that teatowel!) and put it in the fridge for an overnight or longer, prove. When I’m ready to bake, I simply tip the bread out onto the polenta lined baking tray. No fiddling about trying to transfer the dough out of the teatowel and bowl and onto the tray. Mine were the wicker ones from Bakery Bits, my absolute favourite website for buying all things bread-baking related. Everything on there is easy to understand (lots of bread websites are commercial and not reader friendly at all), and the service is great. I started off with a 400g round wicker one and now have two 600g batons and 1k round. I really recommend you get them lined, as the cost isn’t that much more and I really don’t see the point of them unlined. Although NOTE: I washed mine after several uses (you don’t wash them after every use, see the BB blog for more advice on looking after them) and they split. So when you do wash yours, take extra care. I put mine on a short rinse in the machine (which is a Miele of course, so double-good), a process I really think linen liners should be able to withstand. But one split so badly it’s unusable, the other did along one seam. Only one survived completely intact. I wrote to BB about this and they are replacing them and were very courteous. Which goes to show you can’t always control it when something goes wrong, but you can control how you handle it. However, in chatting to Patrick at Bakery Bits, I learned some interesting things. Since I bought my bannetons the site now also sells Matfer wicker lined bannetons (advertised as “heavy-duty” on the site). These are about double the price of the Bakery Bits bannetons. So for example a 1k round regular one would be £10.99 (all BB prices excl of VAT), but a Matfer one would be £19.99. However, the Rolls Royce of wicker bannetons are Vannerie ones, people on bread blogs talk about these with real reverence. To continue the comparison, a 1k lined Vannerie basket is £34.99. I believe they are things of of beauty, and I’m sure are very robust, but that’s just too much for me! But it’d be nice as a present (HINT HINT to all those people who say I’m hard to buy for). If you’re serious about bread-making – and I guess you wouldn’t know that until you’d made lots – then I think the Matfer ones would be good to get, a good half-way house. I can see how the wicker is more substantial and I’d hope the lining didn’t rip. I think the Vannerie ones are for people with the money. But I have a soft spot for the most basic ones, they do the job not just well, but great and considering that you can make sourdough just fine with a tea-towel and bowl, anything above that is surely a step up. This entry was posted in Bread, Equipment, Sourdough and tagged bakery bits, bannetons, matfer, pannetons, vannerie, wicker on July 30, 2010 by Annalisa Barbieri. I’m a big fan of TP products. We have its swings at home. So when I was in the market for a see-saw, I ignored other makes to go for TP, despite that it’s not the cheapest. The Spiro Hop is a see-saw that’s also a ‘merry go round’ of sorts. 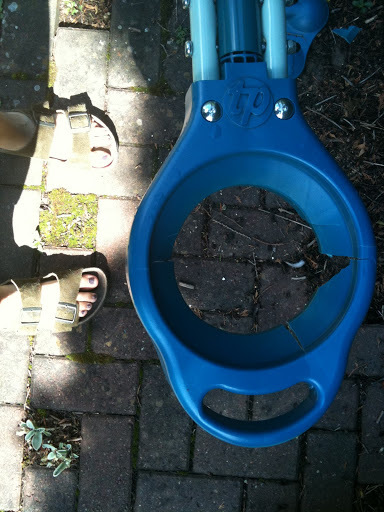 Children sit on it and they can spin round. The Spiro Hop has what look like two Space Hoppers that you sit on. Here it is on the John Lewis website, where I bought it last year. It clearly says it’s for four years and up and that each seat can take up to 35kilos (equivalent to about five stones). My six year old weighs nowhere near that, neither do any of her friends (I weighed that at aged twelve for goodness sake). Anyway it’s been used maybe a dozen times. And this is what’s happened to both seats. the bouncy ball elements have been taken out, please note my feet in the first one, wearing Chanel’s Paradoxal (latest shade, hello!). Now, this is crap. 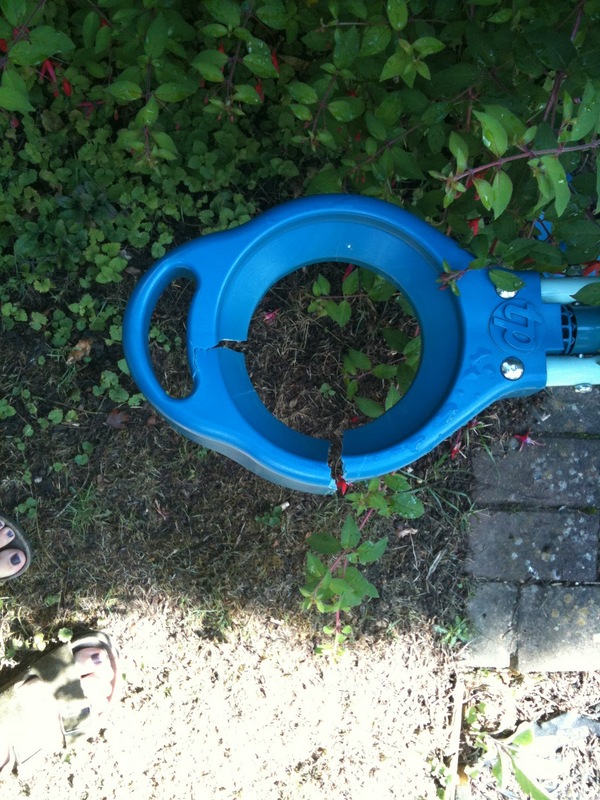 Not at all what I expect from a child’s see-saw after many years of use, never mind hardly any. The only excuse is if really fat kids have been on it and bouncing as if their next Happy Meal depended on it. So I wrote to TP Toys and John Lewis. Anyone who is familiar with my writings over the years will know that I am a big fan of John Lewis. Huge. But very occasionally the online service isn’t as good as it could be. All staff of JLP are partners, but not everyone who works on the online side of the business is. This shows. I met the MD of John Lewis, Andy Street, in late 2008 when we both did a programme for Radio 4 (The Long View). I told him this, that the on-line customer service sometimes lets the side down, probably rather gauchely as I was heavily pregnant and taking no prisoners that day (oh dear, anyone who has been pregnant, or has had a pregnant partner will know what I mean). I purchased the TP Spiro Hop from John Lewis last year (John Lewis order no: XXXXXXXX, 30th April 2009). Because I’d not long had a baby, it took us a while to put it up – the late summer – and since then it’s been used maybe a dozen times. I write as a big fan of TP Toys and John Lewis, but I’m really disappointed by this product. I will attach some pictures and you can see what’s happened to both seats – they’ve broken. The see saw has not had anything unusual happen to it, other than children playing on it, which is surely what it’s intended for? The weight limit as printed on the JL website has never even remotely been exceeded, either. Can I have your thoughts please? John Lewis Direct operate a 28 day return policy. This means that items can usually be returned, free of charge, for any reason within 28 days from the purchase date for a full refund or replacement. This period has now passed and as the item in question was not damaged upon delivery, or faulty, we are unable to accept it back for a refund. If I can assist you further, please get in touch with me. “Please accept my apologies for any confusion regarding the Spiro Hop you purchased from us. I can advise that receiving feedback from our customers, both positive and constructive, is crucial to the on going improvements we are constantly striving to make to both our service and our website. I would also like to inform you that your comments regarding your purchase have been retained for consideration within future enhancements of our service. I still consider that to be pretty crap. TP Toys in the meantime, hasn’t replied yet. I’ll keep you posted. “I find that a disappointing response. You sell a see-saw which clearly states it’s for age four and up and can tolerate 35kilos per seat. I’ve done nothing to take that product outside of those parameters. And it’s been used not very much at all. Do you not have any other feedback for me or comments? Do you think this product is fit for purpose? I am sorry to hear that you are disappointed with my response. I am currently unaware of any problems associated with this product; however, I have made the relevant department aware of this matter. They will investigate further. Thank you for also taking the time to write to us regarding this matter. Receiving feedback from our customers, both positive and constructive, is crucial to the ongoing improvements we strive to make to both our web site and our services. If I can be of any further assistance, please contact me. Now what you can’t see here, because the format of this blog changes it, is that the font for the salutation (“Miss Barbieri”) and the sign-off “(Yours sincerely, etc) is different to that on the body of the message. This makes the cynic in me this is a standard email they have. I’m afraid this makes me even more mad. An update: 12 August 2010. TP and I have been in regular contact. I still haven’t returned the seats to them, but have managed to take them off and put them in an envelope. Did I say ‘take them off’? I barked instructions at my boyfriend to do this and he did so. TP offered to replace the Spiro Hop, saying it had sold many thousands. But I’ve really gone off it. Although I said this wasn’t about a refund or a replacement, the more I thought about it (and read comments that most of you put on FB rather than here, tsk!) the more I thought that I should have something to show for my £88 outlay. So I asked them to replace it with the wooden see saw. This is fab. I will write a review of it in a few weeks/months when it has lived a little. This entry was posted in Consumer on July 30, 2010 by Annalisa Barbieri. 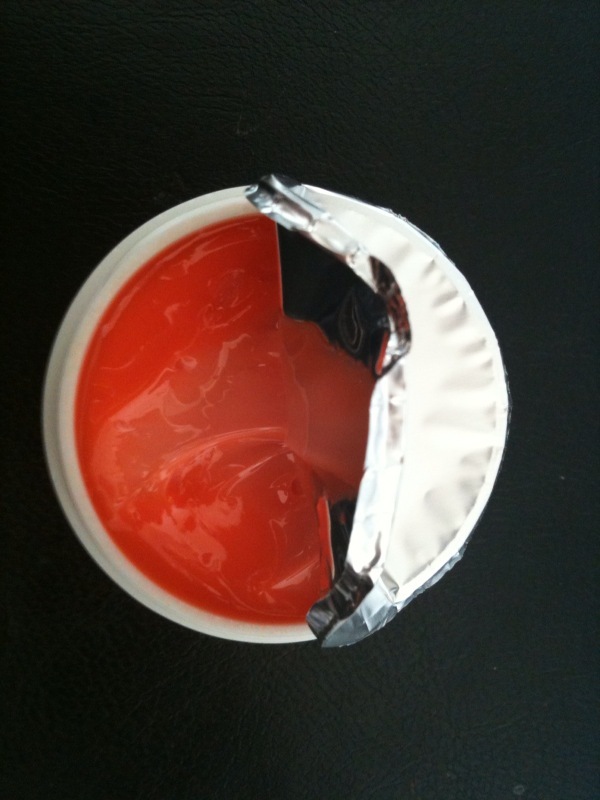 This is a cuticle cream. “For goodness sake”, some of you may be thinking, “what next?” But hang on, because it’s actually not new at all, it’s been around for decades – the design and product is unchanged, which shows you how popular it is. It’s also unlike any other product on the market, so you can’t cheat it, and buy cheaper. Believe me when I say (yes: believe) that nothing comes close. There are loads of great handcreams out there but in order for this to work as well as it does, it has to be really viscous. And a hand cream that thick would be unworkable. Obviously if you are happy with your cuticles, read no further. But this is for people, like me, who don’t bite their nails, but pick at the skin around it. This cream, applied at night, helps you stop doing this because it doesn’t allow any dryness (precursor to picking I think). You can also put it on spots of really dry skin (boyfy-husband uses it on his eczema when his skin splits, ouch). A little pot lasts about a year or more, so it works out very good value per use. Because, er, it’s about £17.50 (Boots.com). 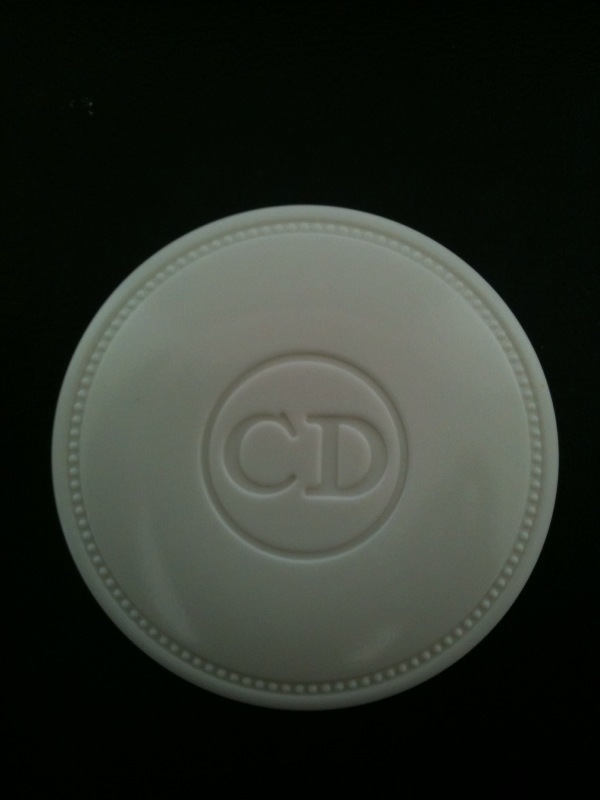 Creme Abricot, the stuff inside, I can’t understand why Dior doesn’t ask me to do its advertising shots.. This entry was posted in Consumer on July 28, 2010 by Annalisa Barbieri. Mint choc chip ice cream. I know this isn’t the best picture in the world but it was hard to get a six year old to keep still. It’s presented in a mini cone. Here’s the gelato in a bowl. See how delicate the colour is? You can also see I have a LOT of stainless steel in my kitchen! This is my current favourite ice cream. I would never buy mint choc chip ice cream, because it’s just not my thing, but this home made version is, I promise you, delicious. Unless you really hate the taste of mint, but even then I’d urge you to give it a try. You can easily leave the chocolate out, but together this makes for a near perfect ice cream in my blog. Which this is. I tend to make my ice cream in small quantities as the fresher it is, the nicer it is. By all means double or treble the amounts, it’s easy to do. This makes about half a litre, which I find is ample for four greedy people. 375ml of cream and milk. You need cream AND milk. Don’t be tempted to use one or t’other because to make ice cream you need both (i.e. not just this flavour). This has something to do with the way the fats mix up and interact. Don’t ask me cos I never listen properly when my dad tries to explain it to me in the same way that I still don’t really understand about what that white powder is he’s given me to put into sorbets. Because I never have whole milk in the house, but I nearly always have double cream, I tend to use 250ml of double cream and 125ml of semi skimmed milk. If you have more or less of one or t’other don’t worry. I’ve also done it with 300ml double cream and 75ml semi-skimmed milk. You get the idea. 15g mint leaves. Don’t be tempted to use anything else, such as mint flavour. Urgh, forget it. In a blender or food processor (I use the little chopper attachment on my Braun MultiStick thing), blend together the milk, cream and mint leaves. The mint leaves should go down to tiny pieces, but don’t over do it or the cream will curdle (however, you’d have to be really stupid to go this far). Pour the whole lot into a sauce pan, and bring to just below boiling point. Turn down the heat and simmer for 5-10 mins. Don’t let it boil, stir it a bit. You’ll see the cream/milk mixture become infused with the mint colour and it will go to a lovely green colour. However, it won’t be that lurid dark green pretend-mint-colour you get in shop bought ice cream. Think Farrow and Ball hues instead. Turn off the heat and let it cool for a bit. Now you can either strain it so that the leafy minty bits stay out or leave them in. Try both and see how you prefer it. Obviously one will give you ice cream speckled with tiny green bits, one won’t. Perhaps if you’re adding the chocolate then having the mint in as well might be overkill. Whilst that’s cooling, get a heat-proof bowl (important) that will fit over the sauce pan (important) and take the whole egg (not just the yolk, which is usual in custard-base ice cream) and whisk up with the sugar until it’s light and thick. Then slowly mix in the (sieved if you’re going to) milk/cream/mint mixture into the egg/sugar mixture. Pour some water into the pan which just had the milk/cream/mint mixture in (doesn’t matter that it’s dirty you’re not drinking it) and place the bowl containing the ice cream mixture on top. The idea is to make custard, so stir as the water underneath boils, and keep stirring until the mixture coats the back of a wooden spoon, which it will do pretty quickly really. Whole process should take about 5-10 mins. Now you’re done, so take the bowl off the sauce pan, let it cool for a few minutes then cover the actual surface with cling film/baking parchment. The reason you need it to touch the actual surface is so a skin doesn’t form. Let it cool for about an hour, then put it in the fridge. You can keep it for up to 24 hours before making ice cream but once it’s cooled right down in the fridge (say a few hours) then you can whack it in the ice cream maker. Once that’s churning, chop the chocolate really small. I sort of semi shave it. When the ice cream has finished, you can just stir through the chocolate. The ice cream will be pretty soft still as all ice cream out of an ice cream maker is soft-ish. Either eat it now or put it in a freezer container and let it harden up more for later. If you want to read about ice cream makers you can do so here. This entry was posted in Birthdays, Children, Ice cream and tagged ice cream, mint choc chip on July 26, 2010 by Annalisa Barbieri. I recently went to see my friend Susie, who had a really cute miniature children’s bench in her garden, like a scaled down park bench. My youngest loved it and spent many a happy time sitting on it, getting up, sitting on it, getting up. Susie was also the friend at whose house I saw the fly curtains that I then bought. Nothing like going round to your friends’ houses to nick ideas. Anyway, in this instance, Susie couldn’t tell me where the mini bench was from so I searched on line and asked all my FB friends where they thought I could get one from. The only place I found was Robert Dyas, it says it’s normally £50 but I’ve never actually seen it for sale for that much, it’s always ‘knocked down’ to £30. Now for some reason this seems a lot to me. Further searching showed that at some point, Tesco’s had had one for the knocked down price of £10 but no more. Of course, I loathe Tesco and never shop there on principle unless it has something I really, really want to buy in which case I forget my principles momentarily.. In our garden we have a Lutyens bench, adult sized. So I was really pleased to see a website that makes them in small size too. In the end, this is what I got because it seemed better value for money, even though it was double the cost of the Dyas bench. I bought it with my birthday money, for my girls. I was going to have it engraved with something cheesy but that cost almost as much as the bench again. This entry was posted in Children on July 19, 2010 by Annalisa Barbieri. Zotter Plum Brandy chocolate. Disgustingly good. The other Friday I was in London. I’d had a really productive meeting discussing something Really Secret. I had something small and healthy for lunch and decided I really wanted chocolate. Now for some time, the only chocolate I eat is 70% plus cocoa content. This cuts down what I can buy and how much of the stuff I can eat as it’s really hard for me to eat too much of it. Plus, you know, high cocoa content chocolate is full of iron and antioxidants. Practically health food. I went to the Food Hall in John Lewis, aka Waitrose in the basement and got into a bit of a tizz in amongst all the whicker baskets (everything, it seems is displayed in them). He took me to this mini display of chocolate, none of which I recognised. The bars were small, 70g, but intriguing. I looked at the price tag of the ‘hand scooped’ chocolate bar: £3.25. Ordinarily, I would never spend this much on a bar of chocolate, but I was in London and I live in Suffolk, so I was sort-of on holiday and the sea-air went to my head. My choice was cut down (no “bacon bits” for instance) as only some of them were 70% cocoa. I selected Plum Brandy. I knew I was onto a good thing when the woman at the check-out said “God they’re so good, I had Bacon Bits last week when we had a tasting session”. I fully expected to, you know, eat half and save half. But this is where I came unstuck. When I opened the bar there were no pieces. It was one big slab of chocolate. I have to say, I’ve dreamed of this. 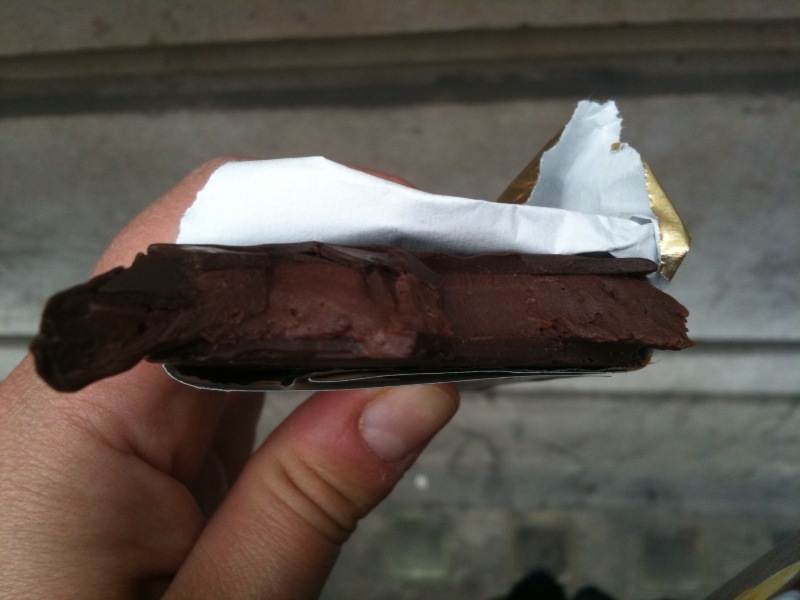 In films like Charlie and the Chocolate Factory, Charlie bites into one huge slab of chocolate at one point. Plus one big slab is so bossy, it’s like it’s telling you you can’t cut it up, you have to eat the whole thing. And it was really hot, so it would have melted, and I couldn’t let £1.625p worth of chocolate just turn to mush in my bag. Even if it hadn’t have been hot, or the chocolate hadn’t have been in one big slab, it was hopeless. This chocolate bar was just amazing, the inside was this wonderful goo and tasted of plum brandy. I also felt slightly drunk by the end of it which must have been my imagination. I’m so glad it’s not sold in my local Waitrose but if you live in London you can probably find it in yours. Be careful. Remember what happened with the MaltEaster bunny, although these are two VASTLY different animals. This entry was posted in Chocolate and tagged chocolate, plum brandy, Zotter on July 7, 2010 by Annalisa Barbieri.